Sequoia Cigar Company - Enjoy a Cigar! Don't just smoke a cigar, ENJOY A CIGAR - at Sequoia Cigar Company. While anyone can enjoy our lounge and smoke in the shop, members enjoy a few more perks. Namely, DISCOUNTS!!! To become a member you pay an annual fee of $1,000 - which you get back in cigars! Plus you get a 15% discount and a 20% discount on box purchases!!! For more information call Bano at (559) 738-8115. 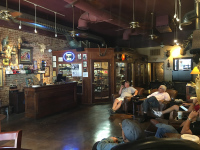 Visitors and Regulars are welcomed alike at Sequoia Cigar Company. Address: 111 North Locust St.